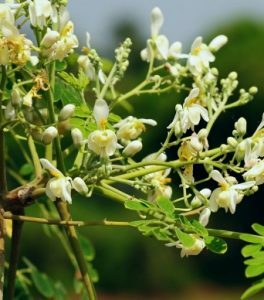 Moringa oleifera is a small, graceful, deciduous tree with sparse foliage, often resembling a leguminous species at a distance, especially when in flower, but immediately recognized when in fruit. The tree grows to 8 m high and 60 cm dbh. Bole crooked, often forked from near the base. Bark smooth, dark grey; slash thin, yellowish. Twigs and shoots shortly but densely hairy. Crown wide, open, typically umbrella shaped and usually a single stem; often deep rooted. The wood is soft.